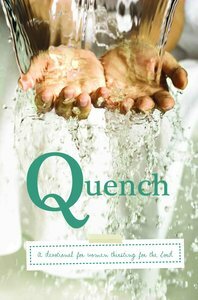 Compiled by the Australian Christian Writer’s Fellowship (Hunter) Quench is a devotional for those thirsting for the Lord. As you read through the pages of Quench you will feel revived, refreshed and satisfied. Do you remember a time when you were so thirsty you craved a drink of cool, clear water? Have you suffered depression and longed to be out of it? Does your soul crave peace and long for answers? If your answer is yes, then take a trip back in time, find why it is so. Walk with the authors and the places they go. About "Quench: A Devotional to Refresh Your Spirit With Living Water"